When tasked with finding a crowd control solution for your facility, you might find yourself overwhelmed by all of the options. Don’t be. Ask yourself these four questions to help narrow down your options. Once you’ve answered them, you should have a better idea of what you’ll need to get started. 1. Is your facility indoors or outdoors? For outdoor facilities, we typically recommend bike rack barricades, or a more heavy-duty retractable belt system. Both of these setups will withstand the elements and provide a sturdy solution for your facility. See our outdoor equipment section for more options and pricing. For indoor facilities, a retractable belt system or post and rope setup is the most popular solution, but it really depends on the look and feel you’re trying to present, which brings us to the second question. 2. What kind of atmosphere are you trying to create/maintain? If you’re purchasing equipment solely to improve line management and wayfinding, and you don’t care how it looks, go with an economy retractable belt setup. The economy brands we carry offer high quality solutions at a reasonable price. If there’s more wiggle room in your budget, explore some of our other brands, and talk with a sales rep to decide what’s best for you. Working with a more elegant atmosphere? In that case, we recommend any of the post and rope systems we carry, because the draping rope effect functions more complementary than obtrusive. Again, there are lots of options here, so feel free to call for extra guidance. 3. Do you plan to brand, merchandise, or accessorize? Most people think that crowd control just exists, that it’s a necessary evil that can’t be improved or removed. While we agree with the latter point, the former is troubling. The opportunities for branding are truly amazing. Whether it’s custom belts with a logo or mission statement, or an exclusive post decked out with your company’s message, there are plenty of options, which we encourage everyone to explore. For retail facilities, we offer a number of different products that improve merchandising with equipment you’re already using. It’s an area where queueing equipment is expanding and improving at an exciting pace. 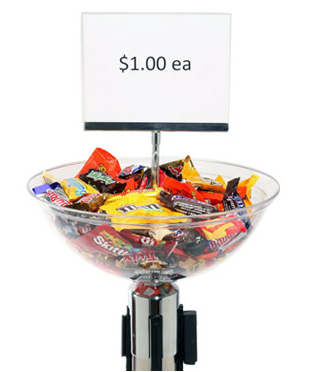 Whether it’s adaptable sign frames attached to your stanchions or merchandising bowls used to prompt impulse buys, accessorizing your crowd control is a simple, cost-effective process that will bring significant returns to your bottom line. 4. Do you want the equipment to be mobile? If you plan on moving the equipment between buildings or different areas of the same facility, there are two great options. Wall mount units are probably your best bet, as you can use them almost anywhere, and they’re light and easy to transport. But if you’re set on retractable belt stanchions or rope posts, we do offer a heavy-duty cart that makes for easy transport and storage. If you find these questions haven’t helped you, or you’re in need of more information, please feel free to call or email with further inquiries. Our crowd engineers are trained to offer consultation across industry lines.